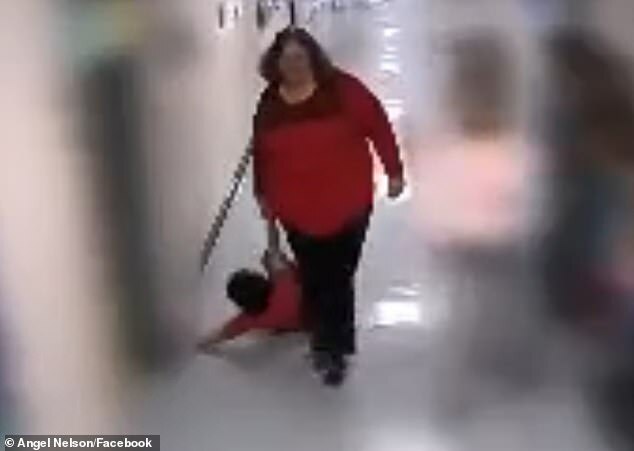 Kentucky State Police say a teacher seen on video dragging an elementary student has been charged with misdemeanor assault. 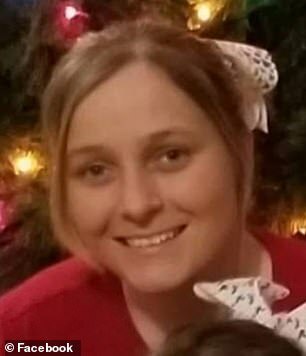 Police Trooper David Boarman said that Greenup County teacher Trina Abrams was the one seen dragging the 9-year-old boy by his wrists in the October video. Abrams is set to appear in court Wednesday. 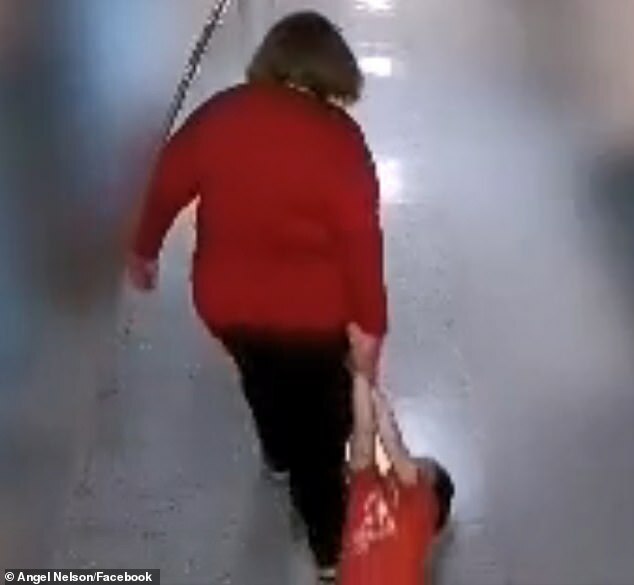 The school district announced her termination on Monday – a day after the boy’s mother, Angel Nelson, posted the footage on Facebook and called for Abrams to be held accountable. Nelson said her son has limited speech and has been diagnosed with autism, PTSD, anxiety and depression. The stay-at-home mom accused Abrams of being so violent that she injured her son and destroyed his shoes. She said doctors confirmed the boy had been left with a sprained wrist, swelling and bruising after she took him to be treated on the day of the incident. 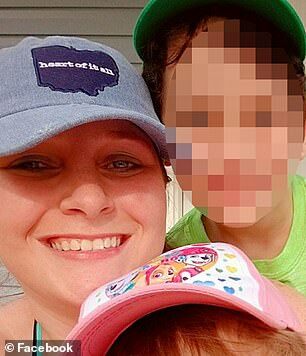 ‘Mrs Abrams forcefully grabbed my son by the wrist and bent it backward while he was experiencing a meltdown (which he sometimes experiences as part of his diagnoses),’ Nelson said. Nelson claims that shortly before the incident, her son had become frustrated by Abrams who had told him to keep working even though he wanted to take a break. She claimed that her son was pushed back into his chair hard. Then she said Abrams started dragging him by the wrist from the classroom and down the hallway. ‘You want to walk?’ the teacher could be heard asking in the clip. 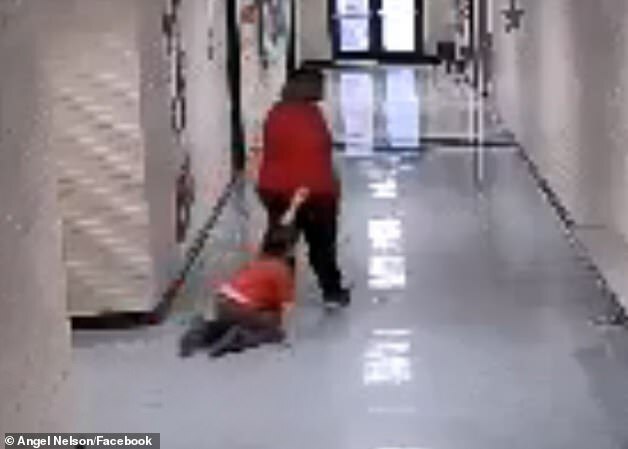 At one point, she paused dragging the student and ordered him to ‘Get up!’ She is seen trying to pull the boy to his feet. He instead, goes limp and refuses to stand so she continues to drag him. 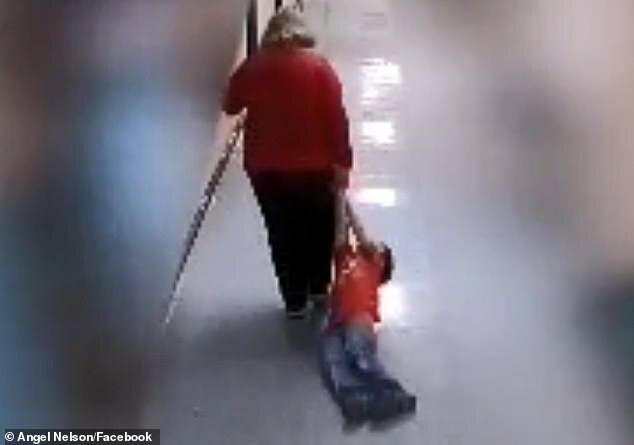 The video showed the boy being dragged past a group of students waiting outside a classroom. Nelson said the ordeal had ’emotionally traumatized’ her son and claims Abrams ‘considers herself to be completely innocent’. ‘She claimed she was preventing him from harming himself but it doesn’t line up with his actions from the video. My son deserves justice. I feel as though Mrs Abrams should be held accountable for her actions,’ Nelson said. The mother added that her son would have to undergo intense occupational therapy because he experienced a regression in fine motor skills – including writing, buttoning his pants and tying shoes – as a result of his injuries. In announcing Abrams’ termination on Monday, the Greenup County School District said in a statement that a formal investigation had been conducted. The incident was also reported to the Kentucky Education Standards Board as per protocol, according to the district.